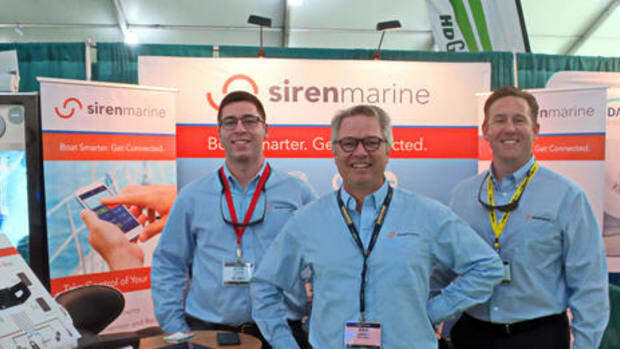 While Simarine only recently showed up on my radar, the company has been developing its Pico monitoring systems in Europe since 2013 and intends to take on the U.S. market next year. 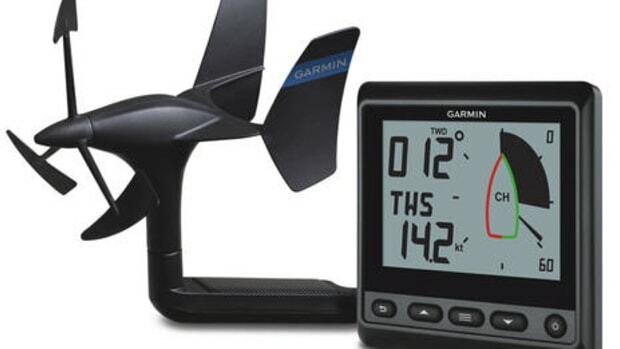 But we&apos;re living in a time of often easy global connections and commerce, and so it was a sailor who appreciated a Pico while chartering in Slovenia and then purchased a system online when he got home who led to my research. 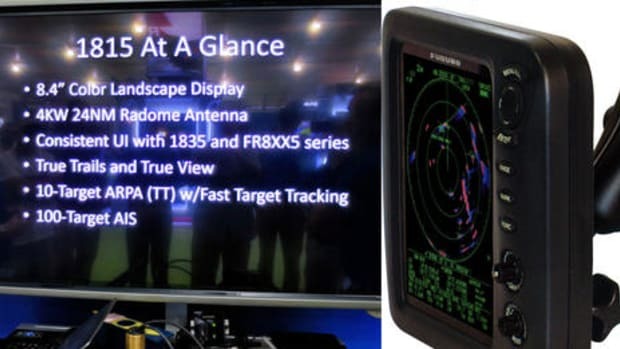 And while it&apos;s a bit daring to install a proprietary network of displays and sensors not yet supported locally, I certainly see the attraction. Consider the value: a Pico Standard Package with a 300 amp digital shunt and lots of additional voltage, tank level and/or temperature sensing costs 399 Euros or about 500 dollars. 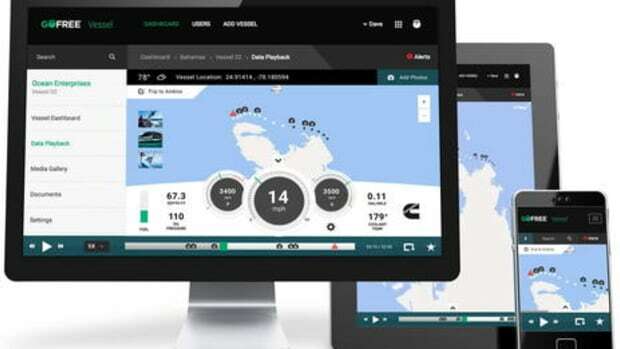 And every Pico comes with WiFi, a powerful companion app, and a development road map that includes remote monitoring as well as an NMEA 2000 gateway. 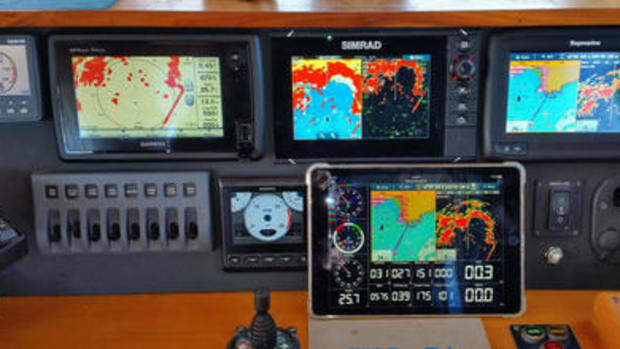 While it&apos;s helpful to see a boat&apos;s major DC current consumers and generators in real time, I think that the holy grail of power management is logging that info for analysis. For instance, after all these years of running refrigeration largely by solar panels and testing many monitoring systems, I still don&apos;t know how much juice the reefer used yesterday or how much the panels put back into the battery bank. I have many ways to see the overall voltage state and SOC, but is Gizmo&apos;s refrigeration less efficient than it used to be, as I suspect? 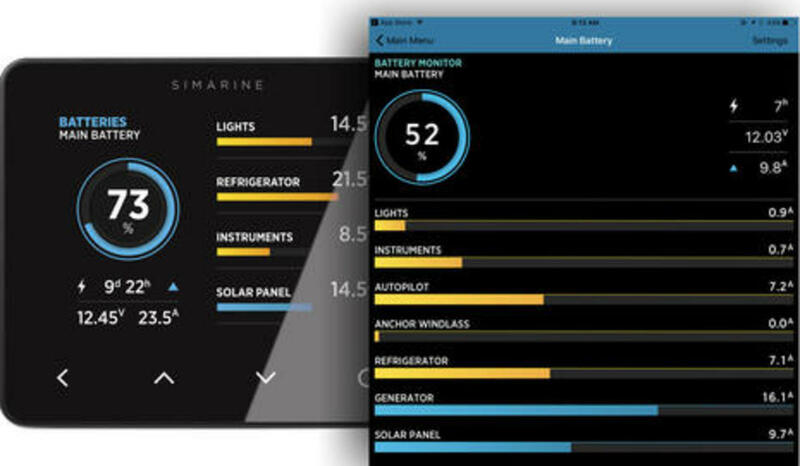 Yes, the Stainless Lobster Fridge Optimizer could probably track (and improve) my refrigeration situation, and adding a Victron GX and BlueSolar controller could result in excellent panel and overall SOC monitoring, but Simarine seems embarked on an intriguing from-the-ground-up approach. 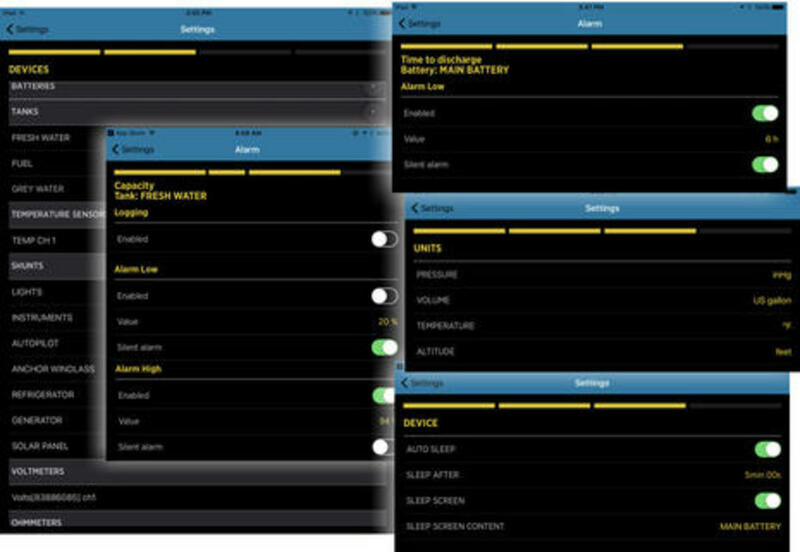 For example, while it&apos;s not yet shown in the Pico app demo or the documentation, I&apos;m told that multiple amp counters are built into the software, and a more comprehensive version, including long term battery voltage statistics, will soon be delivered in one of those easy app firmware updates. 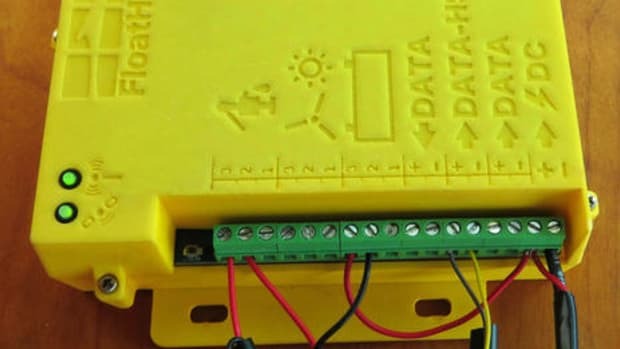 And what other company offers a shunt that can measure four different currents up to 25 amps, 12 or 24 volts, on either the negative or positive side? 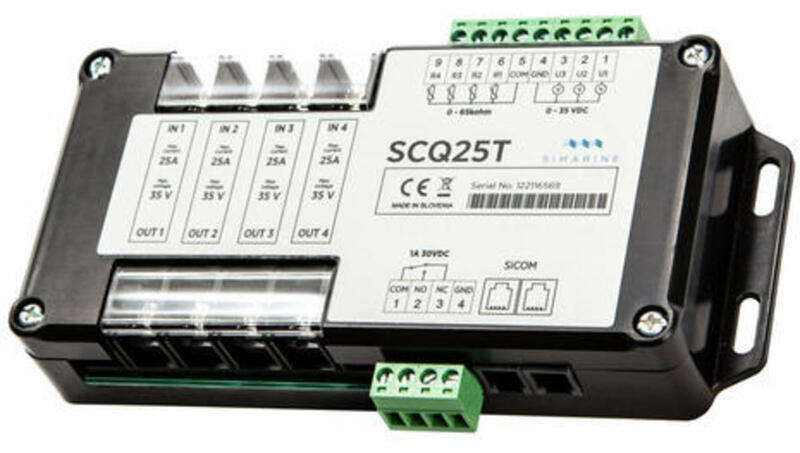 This $177 SCQ25T Combo Quadro Digital Shunt also includes four resistance sensing inputs for tank or temperature sensors, three voltage inputs and an alarm contact, and there&apos;s a SCQ25 Quadro alternative if you don&apos;t want the other sensors or if it makes more install sense to use a separate ST107 module. This particular wiring diagram (worth clicking bigger) shows how a Combo Quadro might install along with the Pico display and a more conventional SC300 Digital Shunt (or the 500 amp version). 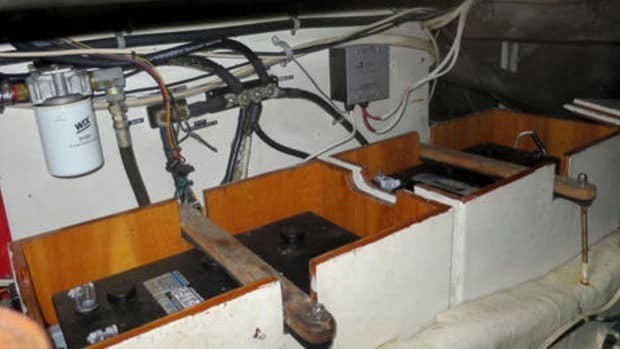 Note that the "SiCOM" data network uses telephone style cables and connectors, which are certainly not as robust as the NMEA 2000 equivalent, but they are common on systems like this, and similar Victron and Blue Sky Energy data cables have survived Gizmo abuse fine. 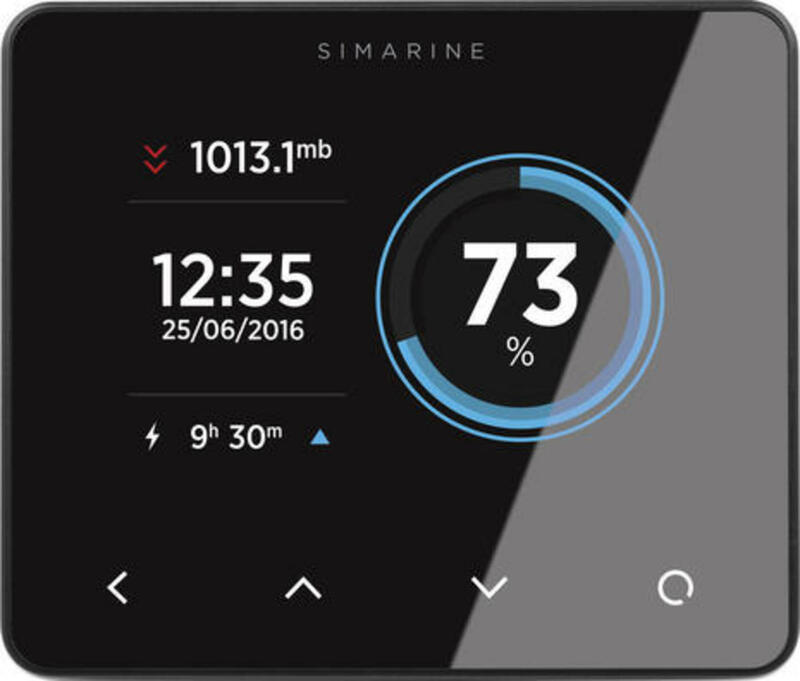 According to the Simarine support FAQ, a bidirectional NMEA 2000 gateway will be available later this year, and that should at least be useful for displaying some of the monitoring values on other displays. 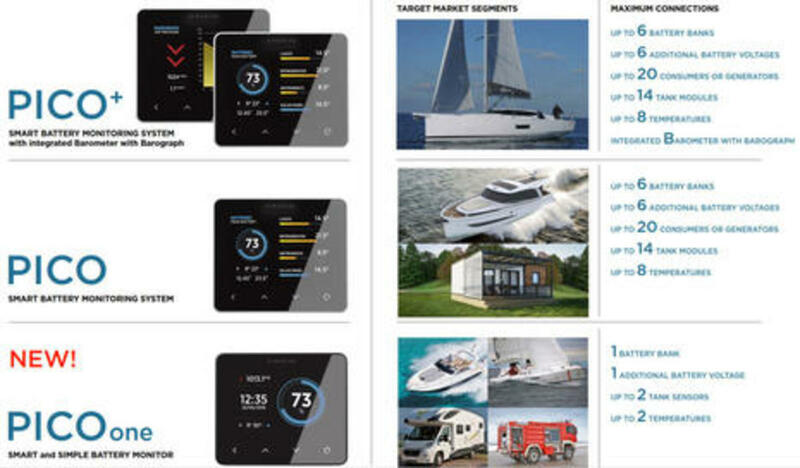 Power monitoring does not seem deeply integrated into N2K yet, and most systems are also designed for other markets like recreational vehicles anyway (Maretron excepted and also bigger digital switching systems like CZone&apos;s). So if you choose a monitoring system like Pico, you are committing to a proprietary network of sensors and displays, but, then again, the developers can work fast with total control. And the results seen in the Pico app impress. For instance, the collage above shows what seemed like excellent sensor management, naming, and alarming, and while I&apos;ve yet to put my fingers on an actual Pico display, I&apos;ll bet that using the app is preferable for setup work no matter how able the little touchscreen is. 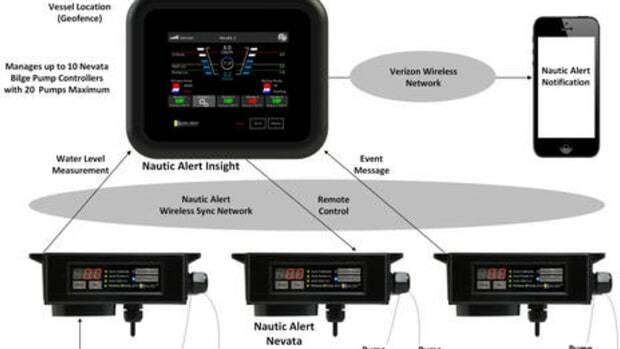 The WiFi connection that enables the app (and easy firmware updates) is also a possible path to remote Pico monitoring, either directly via marina WiFi or through a boat router that might have a high power WiFi, cellular, or satellite connections. Pico router support is in the works and so is "a 3G/4G module that will be able to monitor as well as manage PICO products..." communicating "...two-way with a cloud platform so all data will be accessible at all times and the power usage will be very low." Modern! The Pico manuals are a little vague about possibly important nuances like tank calibration, but I liked the implication that you can make an adjustment whenever you know a tank level with certainty. I also liked the barograph display and how I could specify the units and time period I like best. 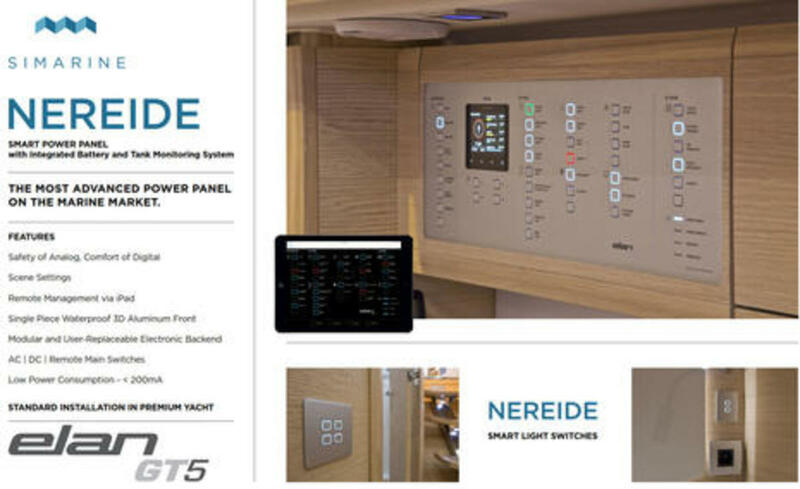 Simarine has also developed the Nereide Smart Power Panel, though so far it&apos;s only mentioned on their Facebook page. Obviously, the Pico monitoring integrates well, and apparently the "Safety of Analog, Comfort of Digital" feature means that there are manual switches on the back of the panel in case something like lightning takes out the digital ones. While there&apos;s already a Nereid app on iTunes, it doesn&apos;t yet demonstrate the panel setup and features like Scene Settings. The rich possibilities seem obvious, however, as does the combination of remote monitoring with remote control. 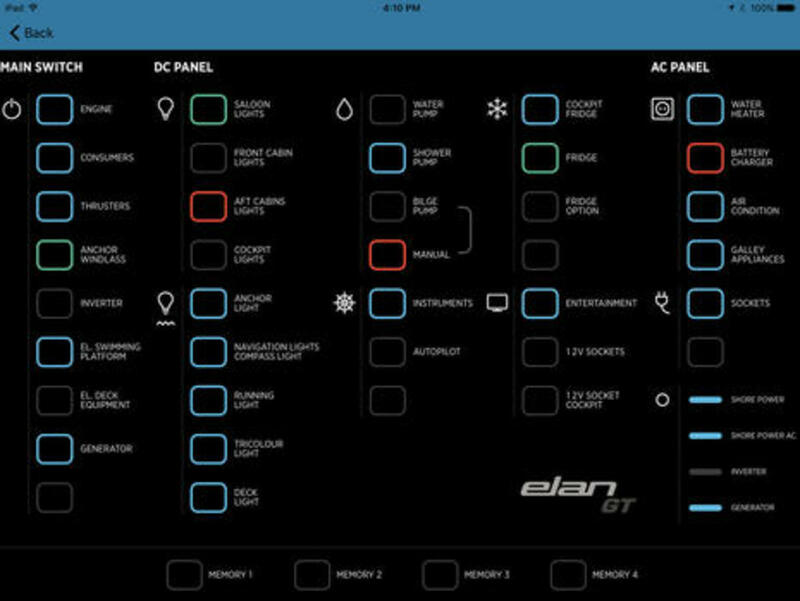 Plus the Elan GT5 performance cruiser will be at several European and U.S. boat shows where the curious might poke around their standard Nereid and Pico installs. 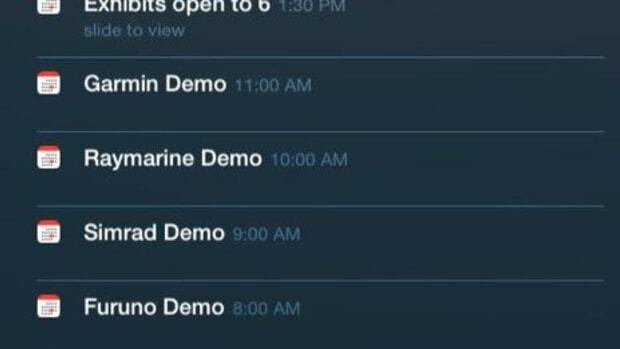 Hello Simarine!